"THOSE WHO FELL BY THE WAYSIDE. Scenes like this were common all over the Armenian provinces, in the spring and summer months of 1915. Death in its several forms---massacre, starvation, exhaustion---destroyed the larger part of the refugees. The Turkish policy was that of extermination under the guise of deportation" -- Photo and caption from the autobiography of Henry Morgenthau, Sr., who was US ambassador to the Ottoman Empire. Few would expect a survivor of the Holocaust to be the face of genocide denial. Imagine the surprise of Suffolk Law School’s student body when its administration’s chosen commencement speaker turned out to be just that. Abraham Foxman, the long-time director of the Anti-Defamation League (ADL), an organization dedicated to eradicating anti-Semitism and bigotry and protecting civil rights, seems a figure beyond reproach. Yet Foxman has invited controversy to Suffolk University for his unwillingness to recognize the 1915 Armenian Genocide—an event which saw an estimated 1.5 million Armenians massacred by the Turks—and his campaign to defeat Congressional acknowledgement of said genocide. Criticism of Foxman has centered on this disconnect, that a man who lived through the attempted extermination of an entire race now denies that truth of another. Many at Suffolk are unwilling to participate in that hypocrisy. Raphael Lemkin coined the term “genocide” in 1944 to describe the magnitude of premeditated racial extermination, citing what happened to the Armenians as the prime example. After the war, the United Nations approved the Convention on the Prevention and Punishment of the Crime of Genocide, establishing genocide as an international crime. The mention of “intent” is significant in this definition. Foxman’s 2007 statement (described below) would go out of its way to avoid labeling the Turkish pogrom as intentional, admitting only that its “consequences” were “tantamount” to genocide. To the casual observer, it is perhaps a negligible distinction. From a legal standpoint, it is strategically evasive. This definition applies to the systematic slaughter of Armenians by the Turkish government that began in 1915. To understand how this genocide came to be, a brief summary of the two nations’ history is required. Existing in various forms for approximately 3,000 years of recorded history, Armenia was the first nation to declare Christianity its national religion. It remained Christian under the several empires that conquered it, including the Muslim caliphate of the Ottoman Turks. From the 15th century onward, Armenians and their fellow “infidels” were allowed to continue their religious practices, though subjected to higher taxes, fewer rights and ethnic discrimination. For the Armenians, this culminated in the Hamidian Massacres of 1894-1897. This state-sponsored pogrom was instituted by Sultan Abdul Hamid II in retaliation for Armenians’ attempts to win civil rights. By the start of World War I, political tensions between Armenians and a new Turkish government were even more strained. Armenia itself had been divided by warring empires, with Russia claiming the east and Turkey claiming the west. Duty-bound, both sides fought for their respective empires. This dichotomy of loyalty enabled the Turks to concoct a pretext that veiled their ultimate goal of an ethnically and religiously uniform empire. A purge would enable them to “liquidate” the “Christian element” and seize the wealth and property of suspected insurgents. On April 24, 1915, the Turkish government authorized the arrest and execution of several hundred Armenian intellectuals. From that point, the executions would continue for eight years, shrouded under the fog of the Great War. Turkish soldiers and mercenaries acting under the general outfit of “Special Operations” murdered hundreds of thousands of Armenians, Assyrians and Greeks, marching them through the Anatolian and Syrian deserts without food, water or clothing. “Infidels” not sentenced to hard labor camps were drowned in rivers, thrown off cliffs, crucified and burned alive. Property was seized, women were raped and dispatched to Turkish harems, and many children were kidnapped and forcibly converted to Islam. The number of survivors is a matter of debate, but of a population of 2 million indigenous Armenians, it is estimated that upwards of 1.5 million were slaughtered in Turkey between 1915 and 1923. Even today, almost a century later, the Euphrates River is filled with the bones of dead Armenians, as author Peter Balakian, writing for the New York Times magazine, can attest. 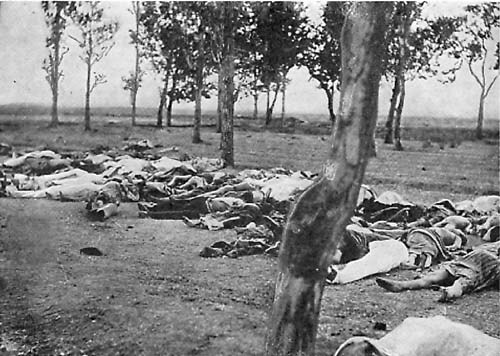 Stark, horrific images exist to document the savagery of the Armenian massacre. Yet still Turkey denies its own legacy. Article 301 of the Turkish penal code makes it illegal to insult Turkey, the Turkish nation or the Turkish government. To acknowledge an “Armenian Genocide” is the most egregious insult possible. But “tantamount to genocide” without intent is not genocide. This calculated elision of “intent,” its palpable absence, is an insult to the Armenian community. The ADL’s defenders decry this as splitting hairs, but they overlook the importance of legacy and how powerfully a single word can affect it. It was important enough to prompt a dozen Massachusetts cities to pull out of the ADL’s “No Place for Hate” anti-bias program. It was important enough that when Andrew H. Tarsy, a regional director for the ADL, acknowledged the genocide as true genocide, he was promptly fired from the organization. Unfortunately for Suffolk Law School, and all those who expect the ADL to uphold its own morality, Abraham Foxman represents a willful blindness—to look the other way on a hundred-year-old crime—for the sake of political expediency. This does beg the question of what recognition the Syrian desert’s uncounted dead deserve, or what their lives may have inspired, but the answers are unlikely to be found in Foxman’s commencement speech.